Every July, tens of thousands of people descend on the city of Pamplona, Spain, for the Festival of San Fermin – and its most famous event, the Running of the Bulls. Booking early has many advantages. 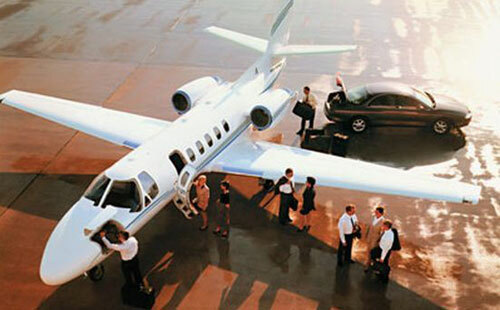 Enter a few details below to start planning your private jet flight to the Pamplona Bull Run. It’s not clear exactly when the running of the bulls actually started. The most logical explanation is that at some point the drovers in charge of getting the bulls from their pens into the bullfighting ring thought it would be fun to have the bulls chase them instead of the other way around. Eight days of bull runs that attract daredevils from around the world. Every morning there is a bull run where six bulls chase locals and visitors alike down the historic streets of Pamplona. In the evening there are bull fights. The rest of the time, there is food, drink and dancing in the streets. The Pamplona Bull Run is a pivotal part of the fiestas of San Fermin that takes place every year from 6th - 14th July. 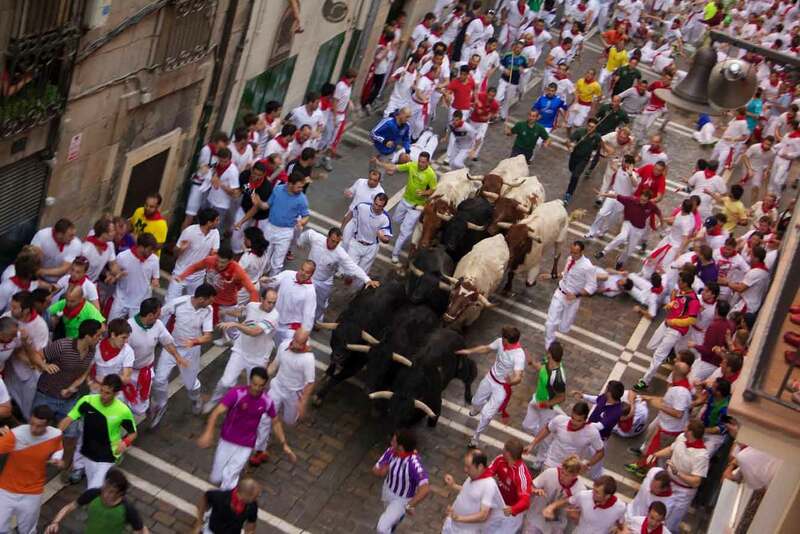 Even though there are many other events that take place during the festival, the daily half-mile bull run down the cobblestones that starts on 7th July is considered as the main event and rightly so as the experience is unmatched. This unique ( read insane) event attracts tens of thousands of visitors each year. Hundreds of thousands of often inebriated visitors crowded into narrow cobbled streets, would pose a security nightmare. 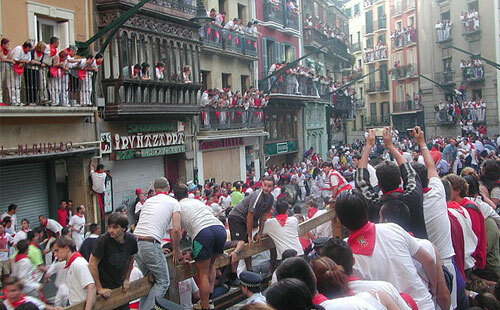 San Fermin was initially started as a weeklong festival to honour St. Farmin, the patron saint of Pamplona. There are many interesting stories to the addition of bull running in this festival. One story suggests that San Farmin died at the hands of angry bulls that mangled and dragged him through the streets of the old town while he was walking back home after having one too many sangrias. Another story suggests that it started as way to bring out the bulls from their pens or offsite livestock enclosures into the bullfighting ring. During this event, the Spaniards and tourists literally run with about a dozen dangerously hefty bulls from the holding pen to the bull ring. Every twist and turn of this thrilling episode that lasts up to 3 minutes is covered on live television. The bull running is conducting through all 7 days of the festival. Every morning runners gather in the streets wearing white and use red accents such as red bandanas, sashes, scarves, etc. Although there is no particular uniform as such, Spaniards consider the white and red attire to represent the saint (white) who was assassinated (red). About the bulls, they are color blind so they just don’t care. The runners wait for the sound of two cannon shot at around 8 am which signal that the bulls have left the pen in which they have been enclosed and are charging towards the ring. The runners essentially run with the bulls while the more adventurous ones run right in front of the bulls for that extra thrill for as far as they can before getting off the bulls’ path. The run lasts for approximately 3 mins. A lone bull is more dangerous than a herd, so sometime steers (calmer & slower bulls) are released along with the dangerous bulls. However, in the Maschimo culture there is nothing more embarrassing than having run with a steer and not with the bull. The onlookers gape as the sea of red and white poppy sticks run for their lives in panic, terrified of being gored or injured by the bulls or being trampled upon by fellow participants. Reportedly there have been 15 deaths mostly from goring since the year 1910. However, dozens of runners are injured every year. Suddenly after 3 mins, the bulls are gone, the terrified participants pick themselves up and head to a nearby bar to grab some good breakfast and celebrate their participation in one of the most life changing experiences. Spaniards from across the country are glued to the television following every twist and turn in the run that last for 180 seconds or less. After the run, there is a bull fight in the evening. Planning on experiencing some unadulterated adrenaline rush at the Bull Run? Here are a few tips to help you survive and not become one more statistical figure in the column of casualties. Observe the run a day prior to the day you run. If you fall, cover your face and stay down until an onlooker taps you with a newspaper roll when it is safe. Get some good night sleep. Listen to the rocket sounds at the start. Stick to the side of the bull, not literally! Please leave the animal alone, the goal is to race not touch it! Large Spanish fighting bulls, toros bravos, from the most historic ranches in Spain stampede down the streets every morning at 8am. They come by the half dozen, and each evening, they are individually danced with, dared with and despatched in the plaza de toros. This is the corrida de toros, mistakenly called the bullfight - it is not a fight, nor meant to be, but a three act tragedy culminating in a ritual sacrifice: the bull always dies. You must be physically, psychologically and technically able to run between thousands of idiots, among which will appear, as though by magic, half-ton-plus wild animals. If you get knocked down, STAY DOWN, people have died by trying to get up and thus putting their vital organs at waist - i.e. horn - height. The pastors - herdsmen - in green polo shirts who run with canes will intervene to take the bull off you as will the experienced runners. San Fermin, or San Fermin de Amiens, to give him his full title, was born in Pamplona, then called Pompaelo, to a Roman senator. He traveled widely from a young age, preaching the Christian doctrine, and was made a bishop at the age of 24 before being martyred at the age of 31. San Fermin was decapitated. Hemmingway's 1926 novel The Sun Also Rises told the world about the Pamplona bull running festival which attracted people from all over the world to this annual festival in Pamplona. It is not a book about the San Fermin festival, but it does have a graphic description of the running of the bulls which has helped popularise the event in English-speaking countries. That same year, in 1924, on the 13th of July, Hemingway was an eye-witness to the first death in the running of the bulls, when Esteban Domeño from Sanguesa, was fatally gored. That event made a deep impression on Hemingway and set off his concept of the duality of death and fiesta, which he later set down in his novel, Fiesta. Many people now believe that he never ran in with the bulls in 1924 and that he was afraid to take part. 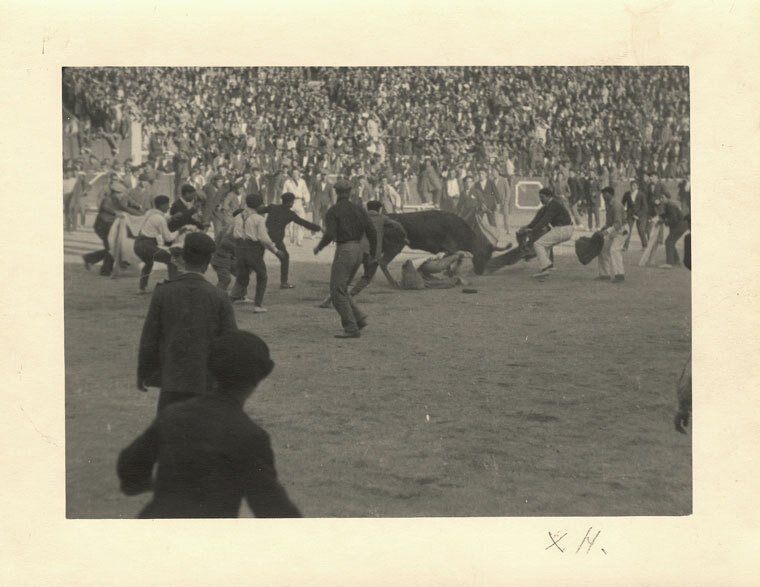 However, in a 1927 photo which illustrates a page in the book and which belongs to the John F Kennedy library in Boston, we can see him playing with the young bulls in the bullring just after the running of the bulls and he certainly does not look like someone that is afraid.